The more I read Dear Thing, the more I became taken in by the book and I just had to keep reading. It explores the pain and suffering of a woman who has had many attempts to have a baby and just can't. So much loss and heartbreak. Claire is a teacher and while I have never been in her situation I identified with her on other levels and really felt for her. I really loved her relationship with Max (a student) and the part she played in his life. Romilly has one daughter Posie. Posie doesn't know her father, Romilly became pregnant with her back in university days, and while Ben, Claire's husband was not the father, there is a bond between himself and Romilly of friendship, although on Romilly's part that is not quite true... a little more? When Romilly offers to be the surrogate mother of a child for Claire and Ben it all seems straight forward but the more time went on, revelations were found out, feelings changed and things twisted and turned. How tough for Romilly to hand the baby over at the end? Will she do it? Romilly has considered herself as not much of a mother figure, yet in actual fact she is rather good at it. Posie though does have difficulties, not the least of all she hasn't got a father, although she loves Ben and Claire. I really enjoyed her and laughed out loud at some of the things she came out with. However she does have difficulty with making friends which as time goes on gets addressed. I also loved her letter at the end of the book. This was a book I read quickly, felt for all the characters and just generally loved it. I have enjoyed books on this topic, surrogacy, and there is always some kind of heartbreak involved. But I keep reading them. 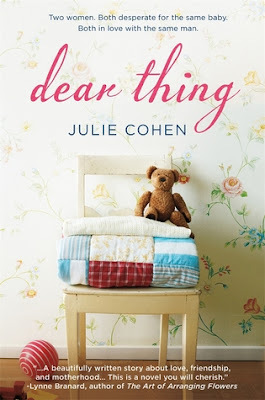 I have a copy of Dear Thing, so I can't wait to dive in. Thanks! Tough decisions usually make for good novels. This sounds like one of those. I feel sometimes we take getting pregnant for granted. It's assume once a couple is ready to have kids it'll be cake, but it can be stressful and it can be hard to understand why one is having difficulty getting pregnant. Two of my BFFs are fraternal twins. The older one was unable to carry so her sister offered to be the oven. When the rest of our crew learned about this we were brought to tears; just thinking about how our dear friend miscarried a few times and IVF didn't work for her hurt for her. However, what a miraculous event to learn about. The toddler is now 5 years old and on his way to kindergarten this coming fall. Wow, great review for a hard subject to read and review about. Great Job Kathryn! I have family members that have experienced this difficulty. Thankfully, all have been successful.